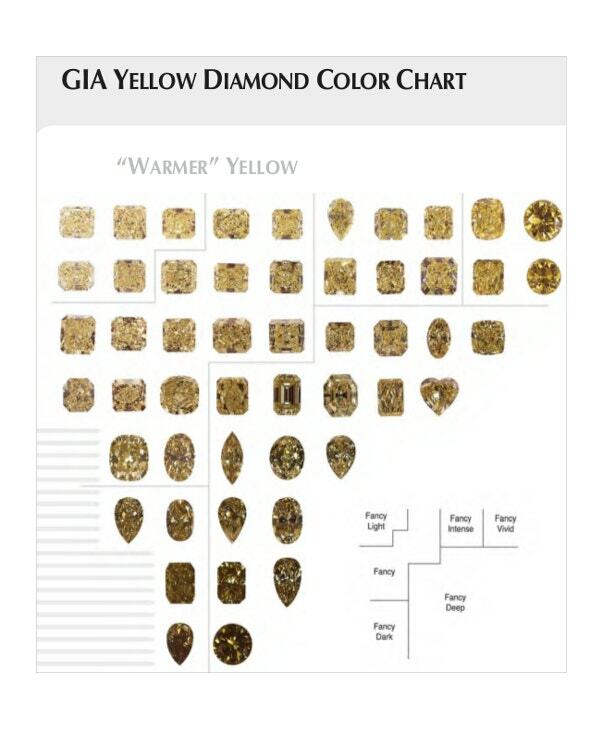 The first color that strikes our mind when we think about gold and diamonds is yellow. Also, many natural diamonds are in yellow color. 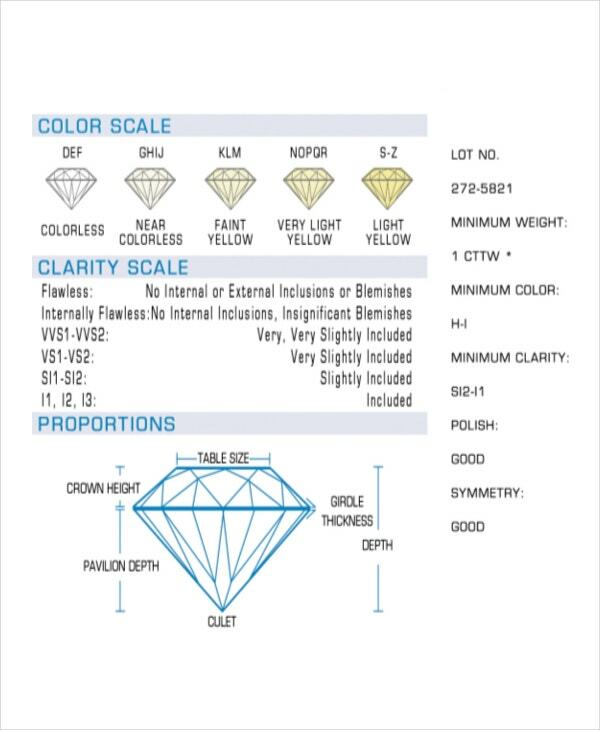 Our Yellow Diamond Clarity Chart Templates help you understand about Yellow Diamonds along with the price list. Use our templates to pick the finest ‘cuts’. Be a smart shopper. You may also see Gantt Chart Template. With the increasing popularity, Black Diamonds are now ruling the roost. They are the best substitutes for white diamonds. Are you thinking of buying a black diamond for your engagement ring? 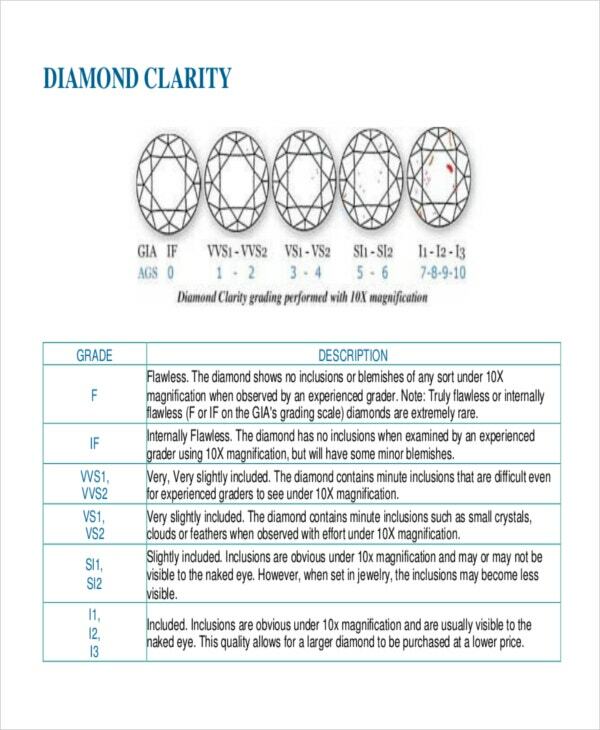 Our Black Diamond Clarity Chart Templates help you know how to go about with black diamonds including the features to look for and cost comparison. You may also see Process Flow Chart Template. Are you looking for diamonds of a rare color? Do you want to gift a precious diamond ring on someone’s birthday? 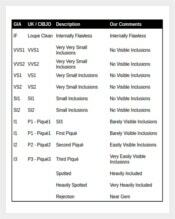 Then our best diamond clarity chart templates can be your fundamental guide. We preach that clarity comes first for any and every diamond. 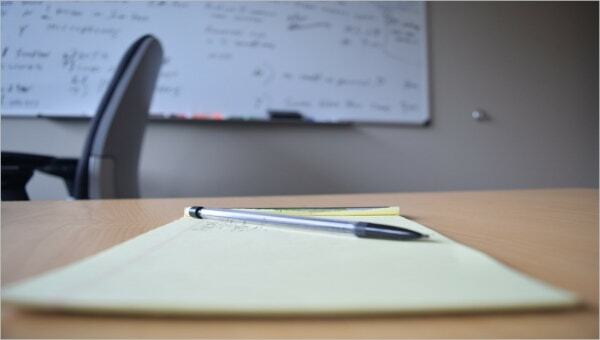 And we practiced our preaching by delivering diamond clarity chart templates with utmost quality. Diamonds that fall under I1 category would have a silver lining and are generally visible to unaided eye. Are you doing a shop-to-shop search to buy the best l1 diamond for your money? 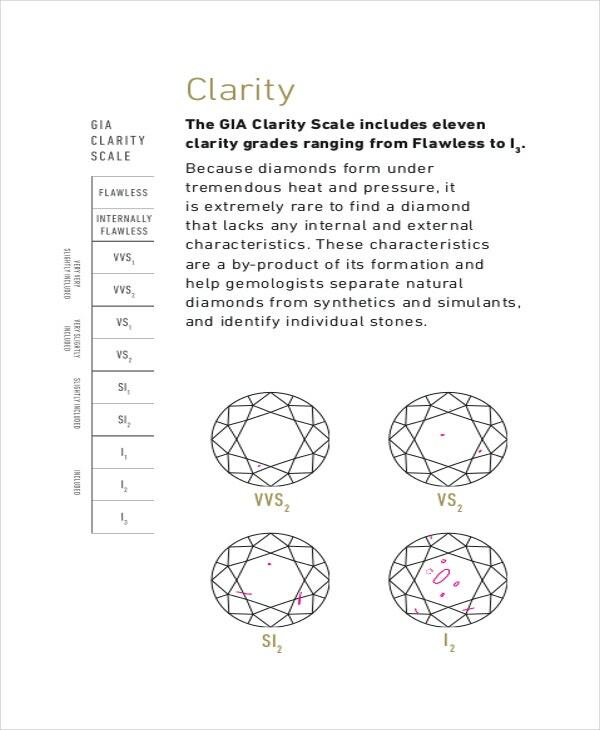 Our l1 Diamond Clarity Chart Templates are the results of our stewardship. They clear the air about the misconceptions that many people have on l1 diamonds. Do you know that many people get deceived with high-quality photos of diamonds and end up buying cheaper S13 diamonds? Do you want to join that flock? If not, use our S12 diamond clarity chart templates. They review the basics really quickly. They rescue you out from that awkward situation of getting cheated with a cheaper diamond. Do you know that the diamonds get the cuts each time they changed the hands, right from its production and distribution? So there is no wonder that when they reach your hand, they become so overpriced for its quality that it’s impossible for you to sell them without losing money. Hence, don’t get into the trap of any misleading ads, which pamper your shopping spree. One way you can keep yourself away from getting scammed is having a complete knowledge about them. 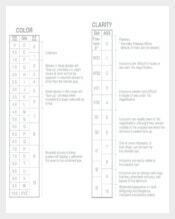 If you are open to taking the suggestions of experts, consider our GIA Diamond Clarity Chart Templates. Gold has lost its game and fame and now with the changed equations, diamonds are taking over. Also, diamond stones became cherries on top. But it’s very important to get the right diamond in your budget. Don’t walk into the trap and buy fake diamonds by seeing magic advertisements. 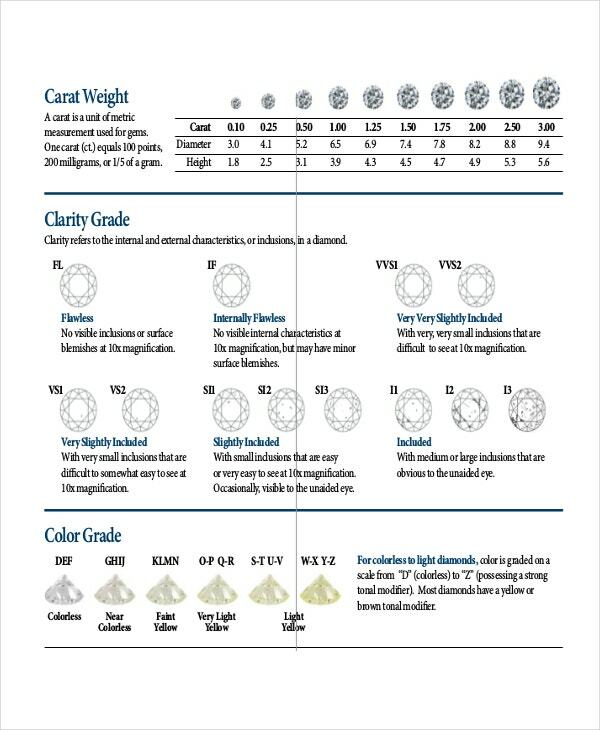 Our Diamond Stone Clarity Chart Templates help you identify flawless diamonds. Get more value for your purchase by using our Templates. You may also see Weekly Chore Chart Template. 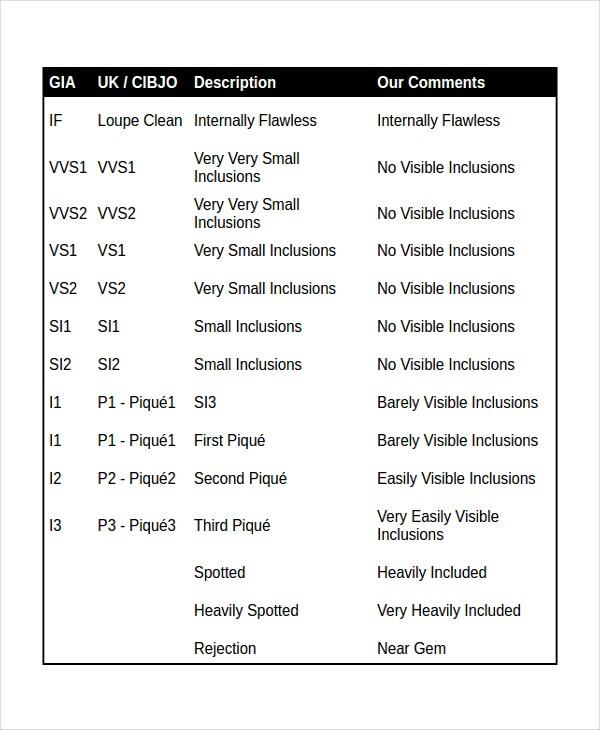 What is a Diamond Clarity Chart? Do you know that no diamond is pure when it is found? Because of the extreme heat and pressure under the earth, all diamonds will have slight imperfections on their surface. 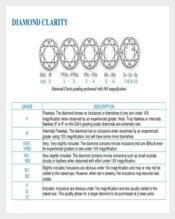 A Diamond Clarity Chart displays the limit to what extent this malignancy can be allowed. It is very imperative that those which have more blemishes will have less brilliance. You may also see T Chart Template. Why is Diamond Clarity so Important? No two fingerprint are alike. Likewise, no two diamonds will have the same internal pattern. But, the purity comes first for any diamond. For example, though there is a family of colors in yellow, a diamond that is stronger in color and with fewer inclusions price much. Also, the rarest of the diamonds cost much. A flawless diamond should be able to pass the color through it without any impediment. You may also see Pie Chart Template. Diamonds are women’s cherished treasure and surprising your ladylove with a diamond ring is a wonderful idea. But don’t invest in a bad decision just by assumption. First, take your time to do some quality research about the 4Cs. Then ‘settle the budget and color questions.’ If your diamond is out of your budget, just reduce the size (Carats). It’s better to go for a round diamond if you have no particular preference. You may also see Guitar Chord Chart Templates. Before buying a diamond, inquire about the dealer’s reputation in the public. You can do this by verifying the feedback from the previous customers and other prospective buyers, if possible. Make sure that the diamond is GIA certified. Also, please check the prices with the remaining diamonds. A Laser inscription helps you trace your diamond in the case of a burglary. Remember that no diamond makes you rich overnight. Don’t run into the traps of those sugar coated emails and lucrative phone calls. Also, buying a diamond online is not advisable. Hope this article prevents you from making a poor decision and rescues from the aftershock.